On Sunday evening last week I arrived in the Netherlands. I had to walk to the climbing gym in the rain (as there is still no bus stop close by). The gym was going to be my new home for the next week. 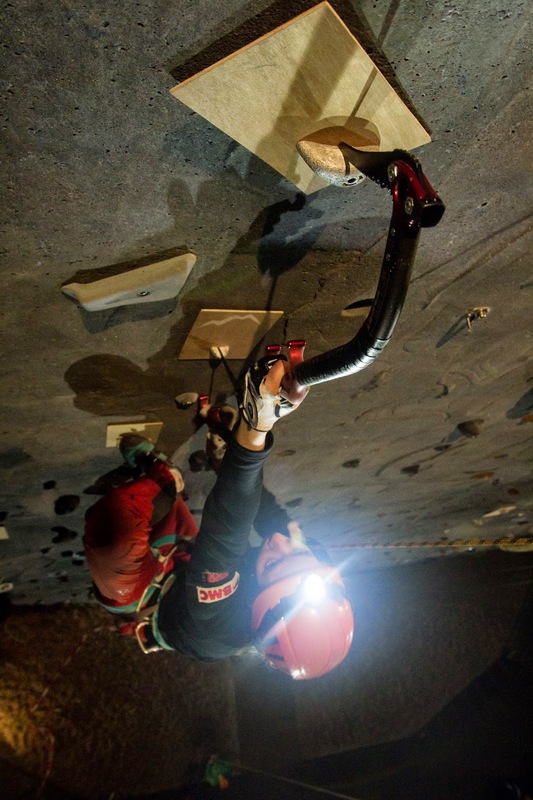 I had just five days to set 22 drytooling routes on the outer wall of the gym. In the rain, the cold, the wind, and the darkness I worked full time form 9 in the morning till after 11 in the evening. Luckily a couple friends had been working really hard too the previous weeks. Bas and Rick have done a fantastic job by putting ropes in the anchors, hauling wood blocks up the wall and even setting quite a few routes. Also Marit, Tim, Tom, Erik, Richard, Elwin and Fedor helped out with the routesetting. Elwin even set the hardest route in the qualifications. 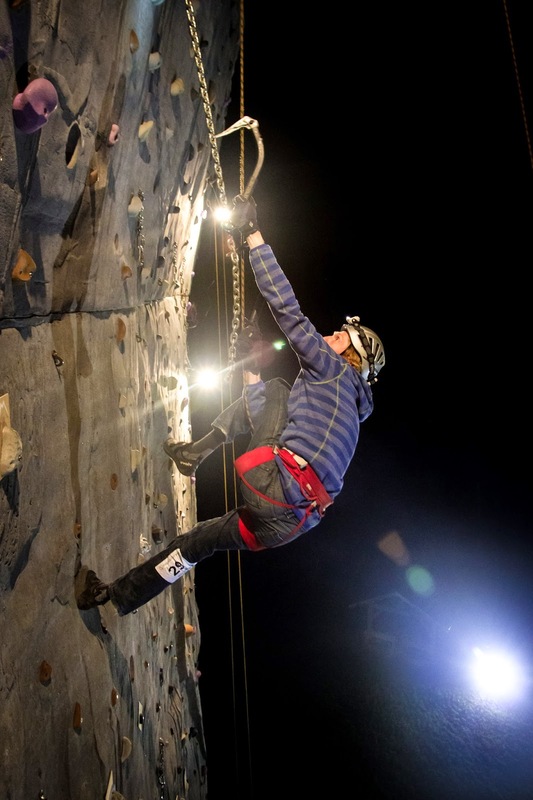 It turned out to be a pretty hard route as only two competitors managed to climb it flash! On friday evening I had something different then drytooling. 'Sinterklaas'. Every year we celebrate 'Saint Nicholas'-day on December 5. The Saint was a good man from Turkey, living in Spain who freed child-slaves and gave them food, a job and housing. The myth says he went by ship to the Netherlands and we always tell children he brings presents for you when you've been a good child over the last year. The saint has 'little helpers' called Zwarte Piet (Black Peter) that crawl into the chimney's to fill your shoes with presents. The chimneys made the faces 'black as soot'. Traditionally we buy presents for the whole family and make 'surprises' and a long poem about the tone receiving the present. The idea is to make fun of the others in the poem. Discuss things that happend during the past year, like a car crash, new job, favorite food or something they're scared of. I drew Dennis for the surprise-poem thing. So I had to make something for him and buy him €15,- present. Okay...what to buy for someone who doesn't like to get presents, doesn't like to get goods as he gets emotionally attached to it and then never dares to throw it away when broken or not longer useful. Peter, the owner of the Monte Cervino gym was working on his present. An artistic impression of a guitar. Or apple, or softball-bat, or... the idea was a guitar. He was using extremely old wood, over a 1000 years old from the old docks in the Rotterdam harbor. As I've studied Forest and Nature Conservation I knew a bit about the wood and figured it was Basralocus. When looking for it online I couldn't even find an English wiki for the wood. The wood he was working on probably comes from Suriname (South America) and it's know for it's high silica content. As it doesn't grow fungae and is really dense (it doesn't float but sinks) it's often used for docks and other water works. And he had much more of it. Oh, I should ditch the paper-folding-T3-conversion idea and go for this. Make Dennis a present that is utterly useless but too beautiful to ever throw away and then hide the actual present inside it. Peter and I decided to make a stone. A stone out of wood. I just got two old ices crews from Vera and there we had it. Cutting, filing, shaping, sanding... Every evening and every day of the week Peter, Arjen and I worked on the stone for a bit. On thursday Peter oiled the stone and suddenly it got his whole beauty. The reddish wood with all the lines and even more special, I had the core of the tree in the middle of the stone. On the side I put the old icecrew and the wood was suddenly a story. It almost shone energy, 1000 year old vibrances of energy. Meanwhile Dennis was on his way from Germany with two friends/colleagues; Vitus and Jan. The deal: you dress up as Zwarte Piet and you get free food, beer and a place to sleep over the weekend. Was hastily got them into their costume and just minutes after we all nicely sat in the living room they nocked hard on the door and jumped in with the presents. Dennis' dad started singing "Sinterklaasje kom maar binnen met je knecht..." and all others joined in. It was hilarious, such a surprise and everyone had so much fun! On Saturday morning all was ready for drytooling. Volunteers showed up and the who circus started running. My parents did the subscriptions, Arjen and Peter the finances and Rutger did an amazing job with all the registrations. Outside there were fires, tents, flags and Peter had sausages for sale. Inside there was free pea soup for all competitors. From 10am to 3pm everyone was free to climb. Flash, all routes had to be climbed flash to get the points. With so many competitors (97 in total, too bad not all subscribed and filled in their scores so on the end results it doesn't show) we had to have that rule. If you fall you're out and that hight is your final score. Though there were 19 routes, so enough for everyone. Jelle had some really bad luck, twisting a hold twice (=technical incident) and so 'waisting' energy he didn't have enough time in the end to reach the high score needed for the finals. I think he could have done really well in the finals too. The atmosphere was positive, friendly and open with only one minor accident. A climber forgot to tighten his helmet and dropped his helmet half way in the route. Much better then last year where I unfortunately had to disqualify a climber. It was all so positive this time, so satisfying! People liked the routes, the sun shone, the music was good, no-one stole ice axes, the soup was warm and time was flying! Before I knew it, it was time to start the finals. Rutger and my parents were counting the results rapidly. Tim and I hung in the wall to adjust the lighting and the holds. It was getting colder and darker but still quite a bunch of people stayed to watch the finals. The six men and women were inside, warming up and getting nervous. 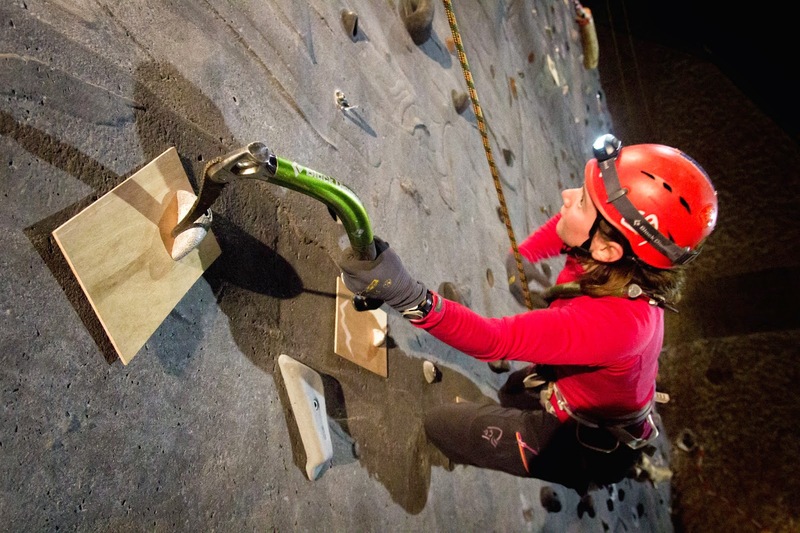 Whilst outside the first woman started her climb. Noel Diepens. She was actually not in the finals but as number 6 didn't show up she was added to the finals. Kind of 'luckily' she didn't make it to the merge of the men's finals. But for a new-be to drytooling, this was a really impressive climb! The next climber was Jojanneke. The crew of 'IGOKO' a new online climbing shop. She's tall and really could use her length. Unfortunately she didn't get as high as her support-team was hoping for. Aniek was next. 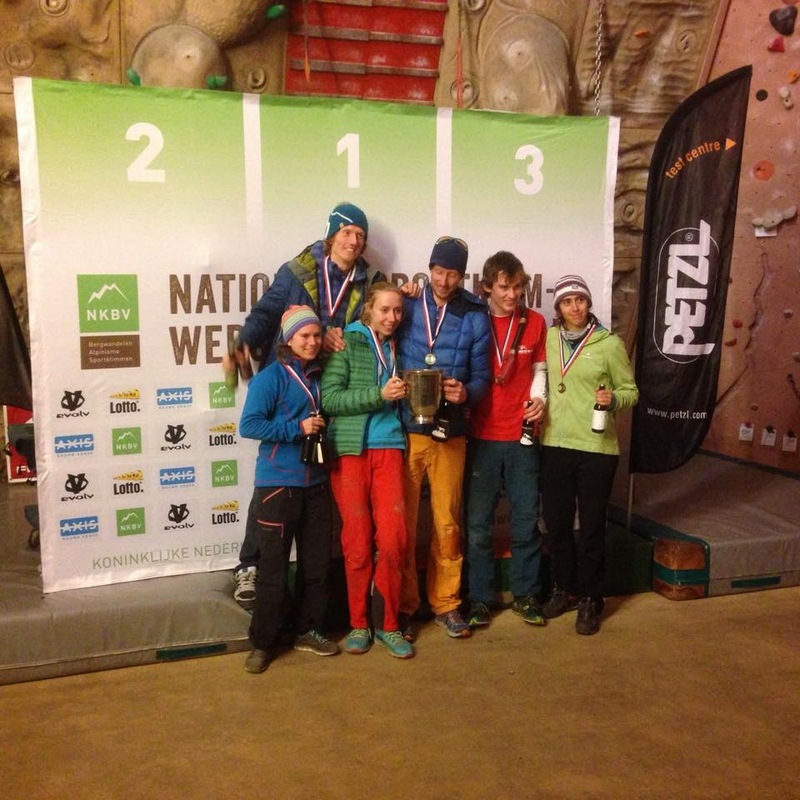 It wasn't her first time in the finals and a couple weeks ago she won the Sportsclimbing Junior Nationals. Not very tall but very strong she got further and further up the wall. The women had 12 minutes to climb. Maybe too much time as it got a little boring to watch the lack of speed. When Aniek got the "one minute" warning she speeded up and slipped off exactly when she timed out. Reaching a new high point. Marin was next to climb. She had an advantage, but her advantage became a disadvantage. The small holds from Edelrid is what she'd been training on lately. But she thought when they were turned in a certain way you could only use them as stein-pull. She lost so much energy on this and fell off early then I expected. Maya to climb next. 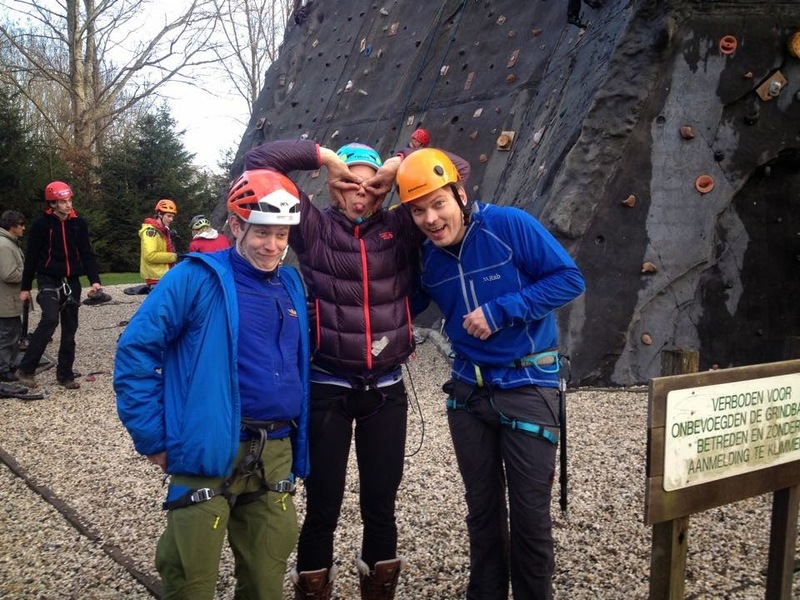 She's the daughter of former ice climbing team member and this year's routesetter Elwin. Reaching the finals and qualified second proves she's got the talent too. Finally Anna had to climb. Anna is doing really well in Scotland on the comps and this is her training for the world cup season. I was expecting her to win, but I was curious with how much difference to the other competitors she'd have. Getting higher in the route she didn't seem as pumped as the others and just made the move where Aniek slipped off. In the chain (the end of the men's finals) she fiddled with her axes and lost one! The men's finals was a different story, also for me. It took me three tries to climb the route in once within the time, so I knew it was possible but not easy at all! 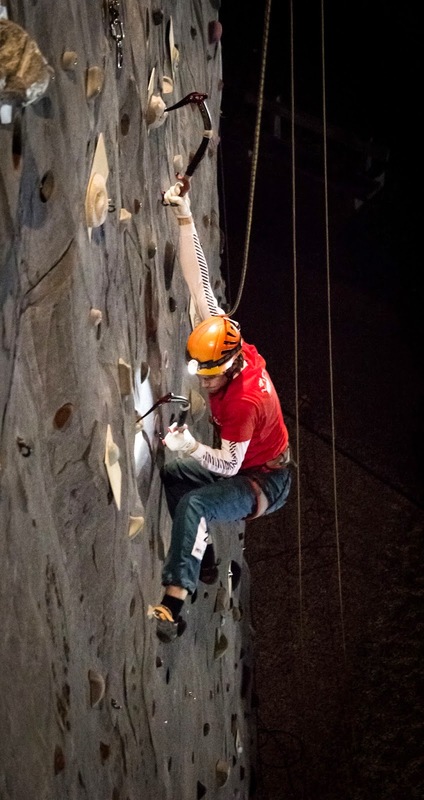 Long moves, technical moves, tricky holds and little time: I'd set the time first on 7 minutes but decided to change the time to 8 minutes when I did the final briefing to the competitors. Maxime, Tom, Harry, Laurens, Fedor and Dennis qualified for the finals. Maxime from Belgium was first to climb. We met Maxime last Spring on the Kahiltna Glacier in Alaska where they also climbed the Moonflower Buttress. Great to see him here again in a totally different scenery and performing well again. I expected an clear result: battle between Harry and Dennis, Fedor just below, maybe something good by Laurens and then 'the others'. Though, that didn't really go as I thought. Maxime got so high in the route! Again I got nervous...what would the others do now...? Tom to climb. You could see he was not as experienced as Maxime with the axes yet but still managed to use creativity to get high. It was his goal to reach the finals and he did it! Harry to climb. He got higher, higher, but the moves sometimes seemed a little long for him. The time was running and when going passed the chain at the top of the wall he timed out... Still a few climbers to go...! Laurens' turn. He's tall. And that helps when drytooling. And it was not his first time he reached the finals. One axe still at the top of the chain and one axe in the wood he timed out, so close to the top! Fedor's turn to climb. Ex-iceclimbing-team-member and still very much into the stuff with ice axes. I know what he climbs...he should do well. Just one more to go. Dennis. Of course I wanted him to win but the vertical wall the unknown small technical holds and my routesetting style are not really his strong points. Just a few moves up the wall he placed his aggressive Krugonogi Giraffe pick as semi-steinpull in the hold. None of the climbers had used the hold that way. Jelle, who was sitting next to me said he didn't understand why Dennis was using the hold so strangely. The crowd was silent. Suddenly the hold broke! I expected it. Why would you use it in this way? I replaced the hold and Dennis had to climb again. He moved steady up the wall and clearly had more speed then the other climbers. With just over 2 minutes left he got at the start of the chain. Most climbers timed-out at this point where Dennis had enough time to top the route. The move from the log to the next Edelrid hold was long. Inspired by the DTS of the previous weekend I knew this moves were possible. Dennis tried and just didn't grab the hold, tried again. Again. The crowd was screaming. And I was so hoping he could do it! He passed the 'one-minute-warning' and tried again. I knew the move was long. Come on, put your feet in the chain, grab the axe on the top and go for it! Once again he just missed the hold and fully timed-out! Tired but happy we went home. But the weekend wasn't over yet. Sunday morning we stood at the gym again. For the first time we'd have kids drytooling! A group of young kids from 8 to 19 years old came to learn the new climbing. We had the worst weather possible: rain and wind and almost freezing. Still all dressed up well and we climbed outside for the whole day. So impressive to see the group climb the same routes as the adults did the day before! And swinging the tools was amazing to watch. Dennis to young climber Letho: "Oh, you better don't use those tools, it's kind of hard to swing them into the wood". The young eight year old tells him "nee hoor", walks to the wood and shows a perfect swing getting my Grivel Froce axes perfectly into the wood. Hopefully we can do this more often and establish a youth team within the next 2 years. That evening Dennis, Vitus, Jan and I drove back to Isny. And today it's office life again. I'm happy I ran this morning (in the snow).